Pasta sauces can be made from many vegetables and comes in a rainbow of colours. The red tomato based and white cream based sauces are the most popular pasta sauces. You also have the green pesto sauces and I’m sure you have seen the black squid ink pasta that has a purple black hue. Today though I’m making a homemade pasta sauce recipe made from eggplants and capsicum. This easy pasta sauce recipe is heavier than the tomato based sauces because of the eggplant and it has a rich roasted vegetable flavour as both the eggplant and capsicum are grilled before blending. Eggplant should be classified as a superfood if it hasn’t been already. To find out more about the nutritional benefits of eggplant, check out the 27 Science-Backed Health Benefits of Eggplant article on the well-beingsecrets.com blog. I prefer using the larger round eggplants in this healthy pasta sauce recipe instead of the long thin ones. You do need quite a few eggplants to make the sauce as the vegetable looses volume when it’s grilled. The same goes for the capsicum. 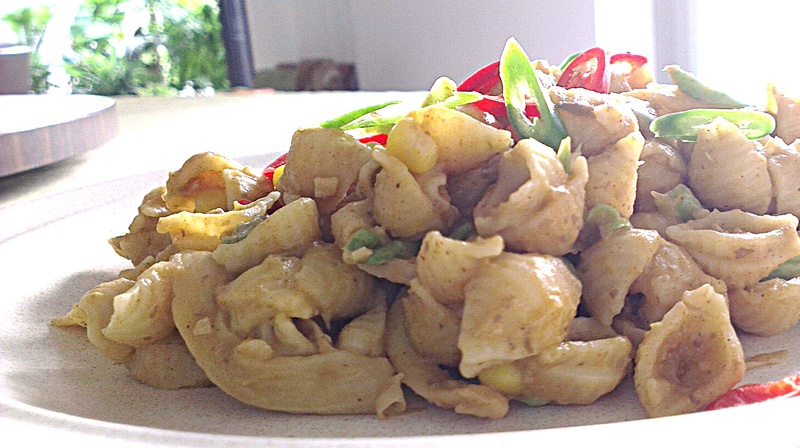 I used yellow capsicums in this dish and as you can see the sauce takes on a saffron hue. Red capsicums give it more of an orange colour. I have never tried green capsicum as I didn’t think it would be a nice colour combination. Other than that, there is no reason why you can’t use green capsicum. 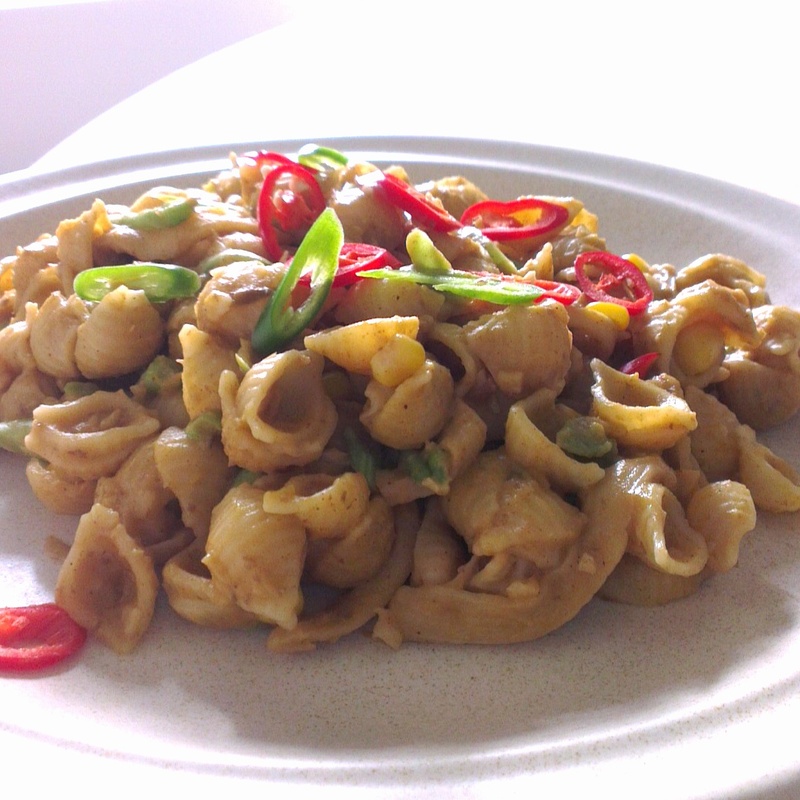 Pasta shells work really well in this dinner recipe as it’s a good shape to cup the shells. I have used spirals and fettucini in the past too. 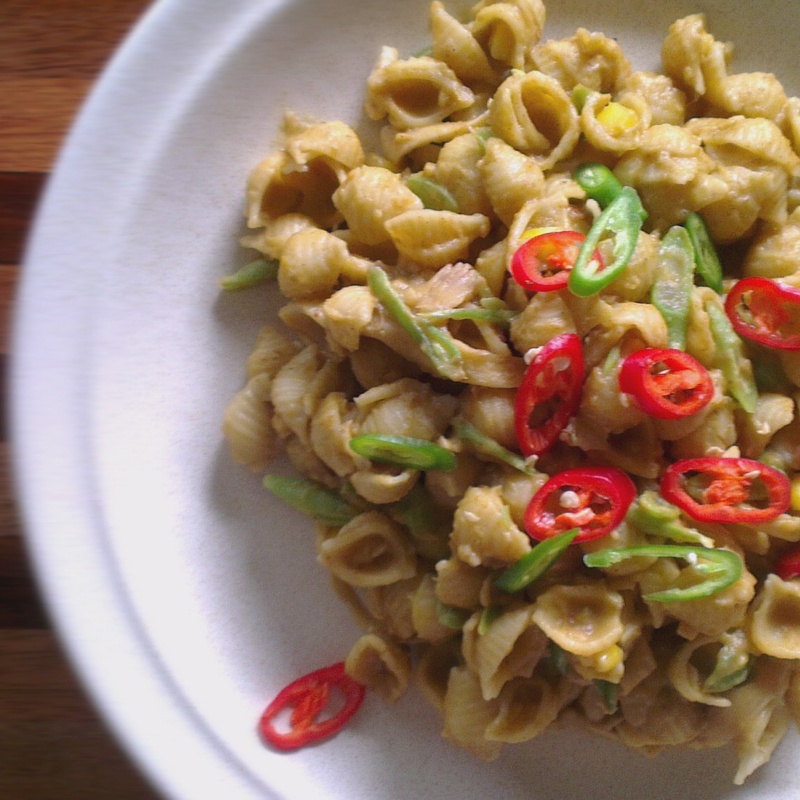 I like my pasta sauce spicy and I have used both fresh chilli and powdered chilli in this recipe. You can omit one or both depending on your preference.Meat lovers can add grilled haloumi, fried tofu, grilled chicken, cooked bacon bits or boiled prawns to make a more complete dinner meal. I was making this for some vegan friends so I didn’t add any of the above. I blended the grilled vegetables in a Nutribullet and the resulting sauce was a smooth puree. Blend it less if you prefer a less uniform sauce. The recipe below makes a large amount of pasta. I was making enough for 10 people. Halve the amount or freeze half the sauce if you are cooking for less people. Cut the eggplant and capsicum into wedges, toss with salt and olive oil and place on a foil lined baking tray. Roast vegetables in an 180 degree Celsius oven for about 20 minutes or until the vegetables are charred on the edges. When the vegetables are cool, blend it in a food processor until smooth. Peel and mince garlic. Thinly slice the mushrooms and french beans. Boil the corn and remove the cooked kernels from the cob. Cook the pasta to the instructions on the packet. Drain and set aside until needed. Heat 2 tablespoons of olive oil in a large saucepan. Fry the minced garlic until brown. Add the chilli powder and fry until fragrant. Add the blended vegetables and water to the garlic mixture and cook until the sauce is bubbling. Add the mushrooms and corn to the sauce and cook for about 1 minute. Add salt to taste. Then add the pasta and lastly the french beans. Stir the pasta and beans through the sauce. Turn off the heat. Add the lemon juice and stir through. 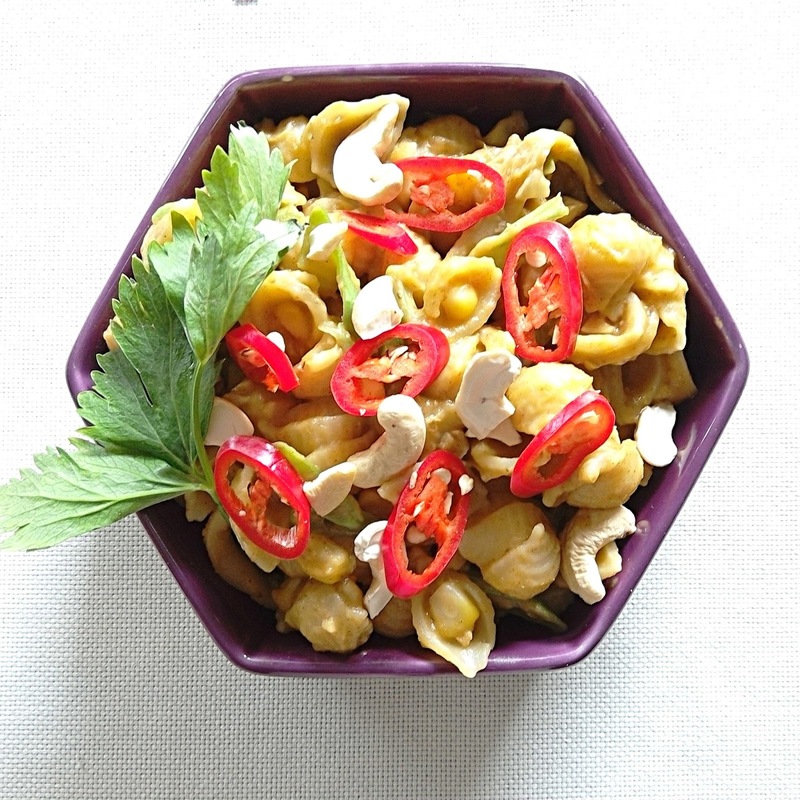 Plate the pasta and garnish with green and red chillies and cashew nuts. * If you decide to use grilled chicken, bacon or haloumi, these can be added as a garnish too. If you are using seafood, add the prawns to the sauce (before the mushrooms) and cook for about 3 minutes. You might need to add additional water or the sauce might get too thick.